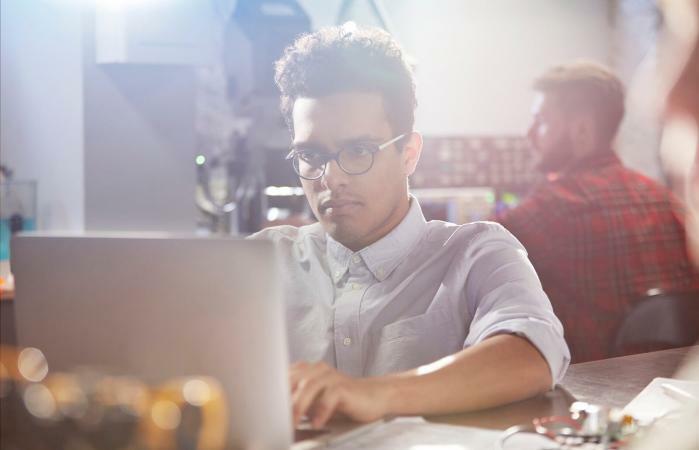 Many factors impact expectations for an information technology (IT) manager's position. For example, in a large company with several information technology employees, an IT manager's role may be largely supervisory. However, in a small organization, the IT manager may work alone, or function as a team leader who oversees the work of just a few people. Regardless of company size, IT managers are typically in charge of their company's computer systems, including networking, hardware installation and repair, software implementation and security. As you review sample job descriptions, keep in mind that no two jobs are identical. The attached printable job description can be helpful to people seeking employment as an IT manager, as well as to business owners or HR professionals who are developing a job description for use in their company. 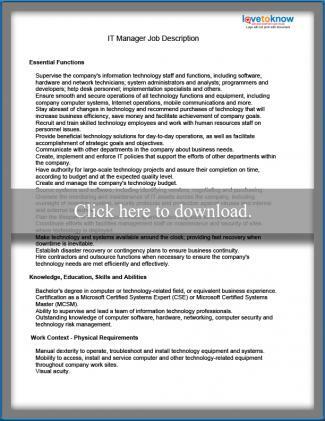 Click to download an IT manager job description. To access a sample IT manager job description, click the image in this article. When you do, a printable example document detailing essential functions, qualifications and physical requirements that are commonly required for IT managers will open as a customizable PDF file. The PDF document will open either in a separate browser window or as an independent document, depending on how your computer is configured. Either way, you will be able to save the document to your hard drive or an external storage device, make changes, and print. You can make changes to the printable job description by editing the existing text. To make text edits, simply click any row you want to change and edit. When you have finished, save your work by clicking the diskette-shaped button in the toolbar or by using the "Save" or "Save As" command in the file menu. When you're ready to print, simply click the printer-shaped button or click "Print" from the file menu. IT managers are responsible for the technology functions within their organizations. While duties vary widely depending on company size and technology needs, reviewing a sample job description is a good way to become familiar with duties, requirements and expectations for professionals working in this type of role.